It’s interesting how the Internet has contributed new ways to meet people. I have developed a number of friendships over the years that are entirely online—though I’d certainly look these folks up if I landed in whatever country they’re in. One such online friend is Flemming Bo Jensen. He is a photographer from Denmark who shares my love of Australia and attraction to the continent’s wilder places. He just finished a photo shoot in the Kimberley and created a gorgeous little video of his experience. I visited the Kimberley on my third trip to Australia, and I was there at the end of the dry season, so the waterfalls were a bit diminished from those in Flemming’s video. Plus I was traveling by land, camping in the remote wilderness, rather than cruising along the coast—though we did have the lovely opportunity of a helicopter ride out along the rivers and over the coastline, so I did get to experience many of the vistas in the video. Though our trips were quite different, it was the same area, and it was an area that I loved. The video captures enough of what I experienced that it’s worth sharing. I’ll have more about my own trip through the Kimberley as time progresses, but I thought it worth sharing this now. When looking at maps of outback Australia, one might be surprised at the number of lakes noted. If you look closer, you’ll usually see that the outlines of these lakes are shown with dotted lines. These lakes only sometimes have water. In a particularly rainy season, enough water may flow into these lakes that they are actually filled. Suddenly, waterbirds appear in the thousands and plants spring up nearby. But most of the time, these lakes are dry (though people are warned to stay off the dry surface, because, depending on how long it has been since the last rainfall reached the lake, it might be a dry crust on top of thick mud, and you don’t want to break through and get stuck in the sticky, salty mud below). However, if you’re driving through the outback, that doesn’t mean you might not see what looks like water. 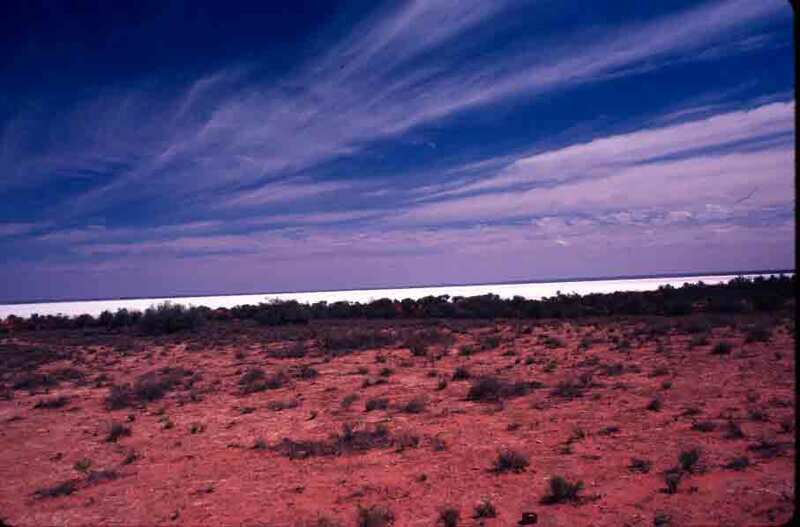 In the poem “In The Droving Days,” Australian poet Banjo Paterson refers to the “The deep blue gleam of the phantom lakes.” These are the lakes we began to see more often as we crossed the outback of South Australia. The deep blue is actually just a reflection of the sky. When there is no water in these lakes, they turn into great sheets of white salt, and at the right angle, the reflective salt presents what appears to be a welcoming stretch of blue water. It is a wonderful thing to see—well, it’s wonderful if you weren’t hoping that it was really water. When you’re not at the right angle to see the reflected sky, or when there are clouds, rather than unbroken blue, these lakes simply present an unbroken sheet of gleaming white, as with the lake below. 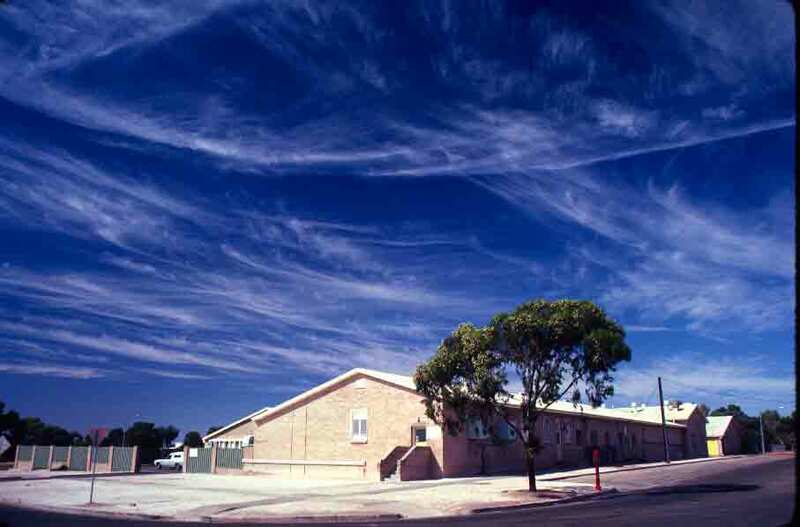 While at Woomera, and in fact as we continued to move north, I was fascinated by the sky. The photo below is at Woomera, while the photo at the top of the blog is from later that same day, in the small settlement of Glendambo. The clouds, like brush strokes from a nearly dry paint brush, stood out in strong contrast to the blue sky. I later learned that this type of cloud is known as a mare’s tail, or, more scientifically, Cirrus uncinus. In addition to not knowing their name when I first saw them, I also did not know (but would soon learn) that they presaged rain. But during that day on the road, I was not thinking of what the clouds meant, just that they were remarkably lovely. A woomera is an Aboriginal spear thrower—something that sends projectiles hurtling through the air. How fitting, then, that Woomera be chosen as the name for Australia’s rocket testing and space tracking station in outback South Australia. We stopped at this intriguing space-age oasis after a few hours of crossing brilliant wilderness. Begun as a joint venture between England and Australia after the end of World War II (a war that had threatened the continued existence of Australia), Woomera has, in the ensuing decades, hosted a wide range of international space research, rocket tracking, and missile testing activities, including a fair bit of involvement with NASA in the early days of America’s space program. At more than 49,000 square miles, Woomera is the largest land-locked missile range in the world. 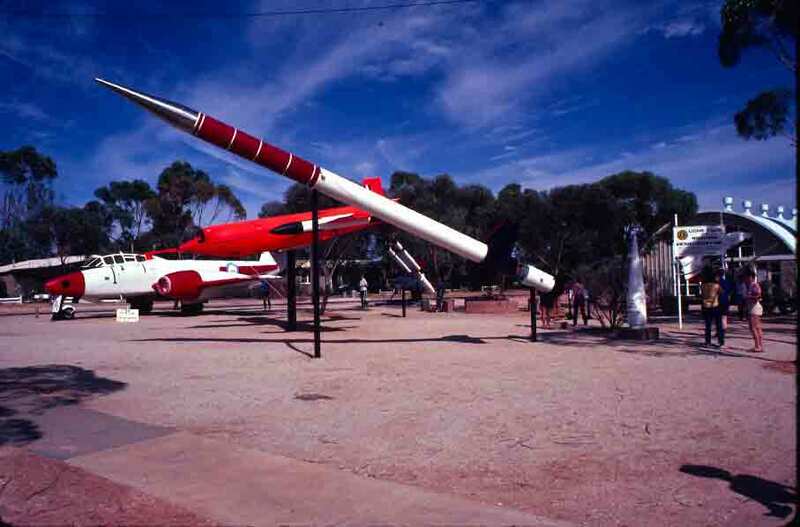 Reflecting the history and international nature of the test range, there is a fascinating Missile Park displaying a variety of rockets, missiles, and aircraft tested at Woomera, located near the tourist information and heritage center. While some missiles tested here were for defense, a large percentage of them were for research, including meteorology and space. Definitely worth a stop if you’re crossing this bit of Australia. Burra has a more recent history that was of almost as much interest to me as its mining past. This is where the film “Breaker Morant,” one of my all-time favorites, was shot. “Breaker Morant” is an amazingly good movie (incredible writing, acting, and cinematography) about a bit of Australian history that is still something of a sore point. Harry Morant was among the well-known Australian poets who got his start in the Sydney magazine The Bulletin (which is described in more detail in the post on the Archibald Fountain.) A horse breaker, Morant published poetry under the pen name “The Breaker.” Morant was among a fair number of Australian soldiers to volunteer to help the British during the Boer War (1899–1902). The British would not think particularly highly of Australians (colonials, ugh) until well after World War I, so when the British needed someone to execute to show the Boers how fair they were, they picked Australians. Without arguing issues of relative guilt (are you innocent if you were ordered to kill your prisoners), suffice it to say there are still hard feelings in some quarters about making the Aussies take the fall for British behavior in the war. 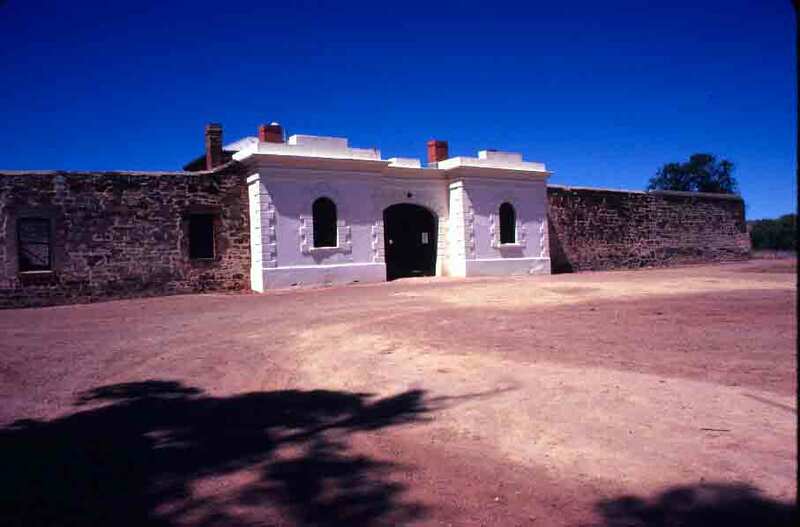 In fact, last year, with new evidence establishing that there were, in fact, orders to shoot prisoners, Australia petitioned Britain to pardon Morant and his co-combatant, Lieutenant Peter Handcock back in December. According to a January 2011 article in The Age (and other sources), additional new evidence has been sent to Britain. Whatever the outcome, it is interesting that the issue is still being discussed. Regardless of where one stands on the issue of whether or not Morant and Handcock should be pardoned, the movie is worth seeing. It is remarkably close to being a perfect film. If you do see (or have seen) “Breaker Morant,” you will likely recognize the two scenes below, from Burra. 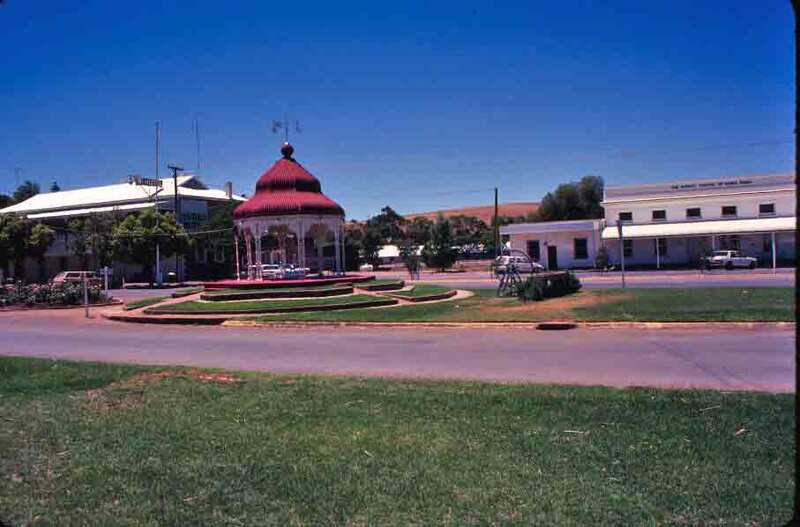 On the left is the Burra town square, where, in the movie, a British band is shown playing in the gazebo. On the right is the Redruth Gaol (jail), the local lock-up, built in 1856, which was used as the barracks and court room in the movie.